MUST WATCH: Mayor Rodrigo Duterte Shows Soft Side By Singing on Stage! Since Mayor Rodrigo Duterte decided to run for the presidential race, the public has been eager to know more about him. He has been famous being firm and frank with his statements, being a strict local unit head and being a crime terminator. No wonder why he became the first option of the majority as what the recent surveys are bragging. 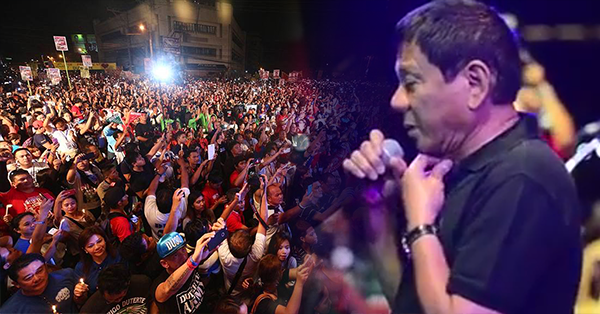 However, in one of his campaign rallies, Duterte showed his soft side and was urged to sing one of his favorite songs. It happened at McKinley Parkway, Taguig City, and named as the Rock de Avance concert. The event was attended by Pinoy artists and music icons and Duterte's running mate, Senator Alan Peter Cayetano. TAGUIG CITY ( APRIL 30, 2016 ) Mayor Rody Duterte publicly reveals what other side of him is little known– his love for singing. At the Rock de Avance concert of Pinoy artists and musicians at McKinley Parkway in Taguig, he sang not the rock rhythm and blues but the old and tested Filipino love song. Oh yes, he is a hopeless romantic too.